This IBM® Redbooks® publication describes the IBM solution for data deduplication, the IBM System Storage® TS7650G IBM ProtecTIER® Deduplication Gateway, and the IBM TS7620 ProtecTIER Deduplication Appliance Express. This solution consists of the IBM System Storage ProtecTIER Enterprise Edition V3.3 software and the IBM System Storage TS7600 family of products. They are designed to address the disk-based data protection needs of enterprise data centers. We describe the components that make up IBM System Storage TS7600 with ProtecTIER and provide extensive planning and sizing guidance that enables you to determine your requirements and the correct configuration for your environment. We then guide you through the basic setup steps on the system and on the host. We also describe all operational tasks that are required during normal day-to-day operation or when upgrading your TS7600 products. The Symantec NetBackup OpenStorage (OST) API can be integrated with Symantec NetBackup to provide backup-to-disk without having to emulate traditional tape libraries. The newly available File System Interface (FSI) supports Common Internet File System (CIFS) and Network File System (NFS) as a backup target. This publication is intended for system programmers, storage administrators, hardware and software planners, and other IT personnel that are involved in planning, implementing, and the use of the IBM deduplication solution. 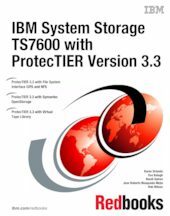 It also is intended for anyone seeking detailed technical information about the IBM System Storage TS7600 with ProtecTIER.